This design is a combination and update of two offshore cruising catamarans of my design which have now collectively logged over 50,000 south pacific sea miles in the last eight years. Ease of handling is achieved by utilising a leisurefurl mainsail and a roller reffing, furling, self tacking jib. A gennaker is employed on a short fixed prod and this is used with a choker. Underwater hull form includes tapered skegs. While still shallow draft they, offer some protection to saildrive legs and rudders, also allowing the craft to be dried out on quite shallow tides prevalent at most tropical locations. Large centreboards offer improved windward performance and also relate to a high standard of safety and manoeuvrability - not achieved by a fixed keels configuration. Lounge seating and dinette are on the main cabin bridgedeck, as is the large navigation station. The tee shaped cockpit is utilised, again for safety reasons and twin wheel steering system is used. 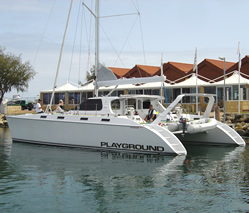 The aft tower offers mountings for radar, solar panels, antenna, davits for dinghy and fastening of a rollaway cockpit cover for sun and rain protection. In all a package of a standard that would satisfy the serious new millennium cruising fraternity.